he radiator stood in the corner of our living room like a brat being punished for a misdeed. In a vacant apartment, it was the centerpiece of a bare bedroom or living room. Spruced up with a new coat of silver paint, it glowed to greet a new tenant. The landlord spared no expense in hiring a Michelangelo to douse the radiator and anything that happened to be on it in a veneer of silver. Consequently, tangles of cobwebs, a roach on a constitutional or paint chips that abandoned the ceiling were laminated on its new exterior. Thus, like layers of sedimentary rock, each coat of paint revealed a history of the wildlife that trespassed over the radiator. Who designed this thing? It should have been placed near a cinderblock wall of a warehouse complementing the tangle of exposed wires, rusty pipes, and meters. Its credentials for dispersing some heat allowed it to barge in and ensconce itself in the far corner of our living room. My Bronx tenement building was built in 1894, when much of the cheap farmland north of Manhattan was being developed to house the burgeoning masses of working-class immigrants. I guess this tubular, cast iron device was a state of the art fixture at the time. It did not corrode; it did not erode. As Shakespeare said of Cleopatra's beauty, "Age could not wither her nor custom stale her infinite variety." So, here we were, forty-five years later in 1939, with this silver mass, unaffected by age, indifferent to fashion, defiantly standing tall, proud and silver. Some unhappy tenants hid its intrusiveness with creative camouflage. The common disguise was a punctured sheet metal veil, allowing heat to escape but concealing the eyesore behind it. In the winter, its top formed a shelf which Ma used for reheating her cuisine. The tenacious food stains became a permanent part of this appendage. In the summer, when the radiator was at rest, Ma placed her annual failure on it. An avocado plant grown from a brown, golfball-sized seed. Her avacodo was not the fittest. It struggled for survival, then dropped its leaves as if it knew it could not compete with an occasionally whistling radiator in the autumn. "Maybe next year, it will be better," Ma would say. It was never better for her next casualty, waiting to germinate. With the arrival of cold weather, steam heat was meted out sparingly. After all, coal came from trees, it did not grow on them. A hiss from a shiny, chrome-plated valve connected to the side of the radiator announced that Mr. Tekula, our janitor, was sufficiently sober to locate the aperture of the furnace with a shovelful of coal. In his usual comatose state, he was awakened by a cacophony of clangs from the tenant's hammers striking their radiators. This Tenant Symphony informed him we were trembling in the tundra. Ma played first hammer in the percussion section. She stepped up in her uniform; a cotton housedress, an apron and felt slippers. As tender as she was with her children, as devoted as she was to her husband, she defiantly held her hammer, dug in her heels, snapped her wrists, swung her hips and followed through like Joe DiMaggio to pound the radiator for a home run. Shards of silver paint darted in every direction leaving Rorschachlike depressions on the radiator in their wake. Pa, in his bathrobe, shivering on his shaky club chair, made sure he played a part in the recital. "Rose, go easy on the radiator. Tekula may be sleeping." "If he's freezing like I am, he shouldn't wake up." Pa's major role was the grip for the concert. He was there with his tiny brush and little jar of silver paint to medicate the scars on the radiator after Ma's solo. When three years elapsed, the landlord was mandated to paint the apartment, radiator included. The scarred martyr was smeared again by his artist's supersaturated brush leaving droplets of silver puddles in its wake. 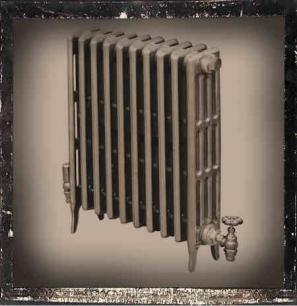 The radiator was left standing within a silver, rectangular outline of itself on our linoleum floor covering. Now it was prepared to take a beating for three more years. If I had foreseen the establishment of the Tenement Museum in Manhattan, I would have bronzed and framed Ma's hammer, silvered a radiator from a junkyard alongside of it, then engraved their history on a brass plate. I would have submitted these artifacts, provided they were spotlighted in a glass enclosed case. Today, the buyer of a two or three story brownstone might inherit these radiators. With a substantial investment they are usually replaced by baseboard or forced air heat; two improvements that evolved in the thermal evolution. But, will there be a history of pounding hammers, clanging radiators and inebriated janitors? Baseboard heaters and grates for forced air have no presence. They melt into the landscape of the living room. If they were within reach, Ma's hammer surely would have pounded them into the floor. Our radiators are history; Ma's hammer is history; our Bronx makes way for another generation's history. Today, most rooms are efficiently warmed through vents or heated foils. We are left without a janitor, without a cast iron radiator, without a hissing valve, without a hammer. What tales can vents or heated foils tell?